Lifetime Shed Facts and Installation Helps. We recently wrote an article about Lifetime Sheds installation on Ezine articles. The article provides helpful information on installation and product description. We encourage all current and potential customers to read through this article before purchasing if possible, and after purchasing if you already have, so you can get some assistance in installation procedures. Lifetime sheds should not be difficult to install. Were not very handy and we can install it. If we can install them, anybody can. What kind of tools they need? 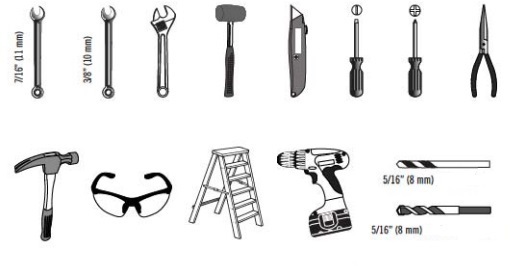 Just a regular household schools including, ratchets set/wrench, screwdriver/drill, ladder, hammer, and of course, safety glasses. We often get questions asking about the Lifetime shed foundation. These do come with a floor, but the most intimidating aspect of assembly is pouring your own concrete. The instruction Manual shows you exactly how big to make the concrete slab. The concrete slab is the best option to go with, but it can also be the most expensive. There are alternatives. Let me explain the most common alternative. If you're not using concrete may we suggest using treated wood. Make sure the lumber you are using is treated and approved for outdoor use. You simply build the frame according to the instruction Manual that matches the footprint of the shed with the studs 16 inches apart similar to this image below (your owners Manual have a more complete diagram). The next step involves using nails to fasten the plywood to the frame. You can also fill the frame with gravel, that that is usually more expensive. This method ensures that the surface is completely flat. It is also important to drill drain holes. Again, this is all in the owners Manual. The rest is a piece of cake. Sure, it will take you about 6 to 8 hours to assemble. But it is not 6 to 8 hours of head-scratching confusion. Its just time consuming. Depending on the shed you'll likely assemble it in the following order:1) Roof trusses 2) Gable assembly 3) Left and right door assembly 4) Skylight assembly 5) Floor assembly 6) Wall assembly 7) Roof assembly 8) Window installation 9) Accessory installation (shelves, pegboards, tool corrals, etc. )The one important to get before you even get started is to contact your local city office building. They will let you know what their local codes and ordinances are. For example, your particular city may require that you build a shed no closer than 5 feet to the neighbors. Your city may require hurricane straps or that you anchor this to the ground. Your city might even prohibit plastic sheds altogether. That is quite rare, but I have seen it happen. It is also a good idea to check with your local neighborhood HOA and CC & Rs. If you need more information please don't hesitate to contact us. We can forward you copies of owners manuals, answer your questions, or point you in the right direction.